David Silva and James Milner struck late in each half as under-fire reigning champions Manchester City grabbed a scrappy but much-needed 2-0 win over Leicester in the Premier League. Silva pounced from close range to put City ahead after an unconvincing start at the Etihad Stadium and Milner came off the bench to settle nerves in the last minute. It was far from a fluent display from City but the result will at least take some of the heat off manager Manuel Pellegrini after a testing few days. The hosts could justifiably claim victory was deserved after forcing veteran goalkeeper Mark Schwarzer to make several fine saves. But the Foxes were denied three penalties – with two appeals looking particularly strong – and defeat was harsh on the hard-working bottom side. Luck was therefore on Pellegrini’s side after the build-up to the game had been dominated by criticism of his tactics in damaging losses to Barcelona and Liverpool and speculation over his future. The Chilean responded strongly to that by dropping captain Vincent Kompany to the bench while Samir Nasri and Fernandinho did not feature in the squad. Edin Dzeko and Pablo Zabaleta also found themselves among the substitutes in the reshuffle, while £25million January signing Wilfried Bony was handed his first start. The changes initially appeared to do little to fire up the side. No spark came from the crowd either with the atmosphere subdued following the last two dispiriting results. What flicker of life they did show in the opening stages came from Jesus Navas, who looked in the mood after being left out at Anfield on Sunday. But it was Leicester who threatened first, with Jeff Schlupp completely wrong-footing Eliaquim Mangala on the counter-attack. Martin Demichelis came across to help out his partner. Leicester then had their first two penalty appeals in quick succession. 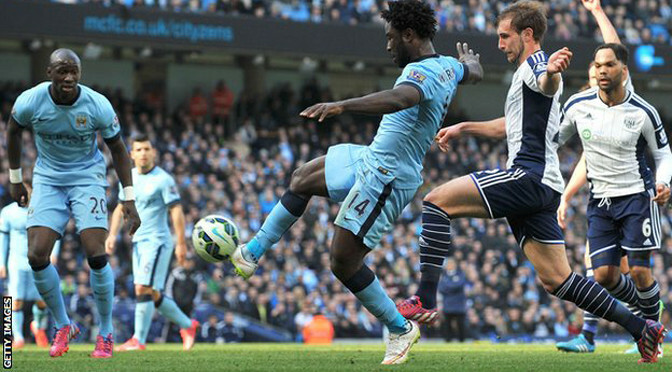 Schlupp was unlucky not to get a decision in his favour when it appeared he was impeded by Bony. Andrej Kramaric then went down as he raced with Joe Hart to meet Riyad Mahrez’s superb through-ball but the England goalkeeper did get a touch before the pair collided. Navas was berated by Yaya Toure after misplacing a pass but he was not deterred, firing in a good cross from which Bony forced Mark Schwarzer to block. Navas then tested Schwarzer himself with a good effort from the edge of the box before Silva teed up Bony with a clever ball, only for the Ivorian to slice high and wide. City were performing only in fits and starts but they seized the advantage on the stroke of half-time as Aleksandar Kolarov crossed from the left. Bony was unable to take advantage but Silva pounced, tapping in from close range after his initial effort was partially blocked by Wes Morgan. Bony made an even bigger mess of a chance early in the second half, racing into the perfect position to meet Navas’ pull-back but completely miscuing and hitting the corner flag. Leicester were again unlucky not to be awarded a penalty when Fernando brought Kramaric down, but referee Robert Madley ruled the offence just outside the area. Replays suggested it may have been just inside and Kramaric was denied again as his free-kick was deflected agonisingly wide. City wanted to kill off the game but Schwarzer kept the Foxes in it with a fine save to keep out a Sergio Aguero header and did even better to claw away a long-range Toure strike. The hosts had a let-off when Mahrez got away a shot and a slight deflection took it past Hart and onto the post but City responded with Toure and Kolarov going close. Bony’s frustrating debut had been brought to an end after 72 minutes and his replacement, Milner, did finally end the contest when he turned in a Navas cross in the closing moments. Liverpool put a huge dent in Manchester City’s title hopes with a 2-1 victory which dramatically enhanced their own hopes of a top-four finish. Chelsea’s involvement in the Capital One Cup final had given Manuel Pellegrini’s side a chance to reduce the gap at the top to two points but, as was the case last season, they were cut down at Anfield. Eleven months ago defeat here did not prove their undoing in the title race as Chelsea did them a favour by winning at Anfield. This time it was Liverpool doing Chelsea favours — not something their fans would usually celebrate but on this occasion their club’s needs come first, and with the championship beyond their means, the race for Champions League qualification takes priority. Jordan Henderson’s brilliant opener was matched by an equally good team goal from Edin Dzeko but Philippe Coutinho’s 75th-minute winner eclipsed them all. Anfield is a bad ground for City, who have now not won here in 12 league matches, yet it was supposed to be their hosts who were mourning a Europa League exit to Besiktas on penalties on Thursday. City reverted to the team which thrashed Newcastle 5-0 last weekend after losing to Barcelona in midweek but it was the home side, registering four changes — most significantly returning playmaker Coutinho — from the defeat to Besiktas, who got off to a flier. Coutinho, who twice set up Adam Lallana to first shoot weakly at Joe Hart and then brilliantly finish from a narrow angle only to be judged marginally offside, was the instigator. Pressing hard he robbed Vincent Kompany and rode a challenge from the City captain before laying off to Raheem Sterling, who gave Kompany a torrid time in the first half, and he teed up Henderson to curl a beauty over Hart and into the top corner in the 11th minute. Immediately the intensity went up a notch, with Sergio Aguero breaking free of Skrtel and beating Simon Mignolet but not the far post with a left-footed shot. It was end-to-end stuff, with the creative Coutinho and equally mercurial David Silva running the show for their respective sides, although an honourable mention should go to the pint-sized Joe Allen, who was a giant in midfield against players of huge size and even bigger reputations. The former’s ball with the outside of his right foot sent Sterling racing down the left wing, but although he easily jinked past Eliaquim Mangala, City’s 32 million-pound summer signing, his cross rolled through the six-yard area with no-one to knock it in. Silva was increasingly finding space in front of Liverpool’s back four, the area where he is most dangerous, and from there he crafted City’s 25th-minute equaliser. The Spain international picked out Aguero, whose sublime ball to Dzeko was deservedly rewarded with a goal as the Bosnian slotted past Mignolet for his 50th Premier League goal. From then on the game became even more open and entertaining, something of a rarity for a noon kick-off on a Sunday. Both defences looked to be the weakest links, with Mangala equally out of touch as Kompany while Dejan Lovren’s presence in the back three, after his penalty shoot-out miss in Istanbul cost his side Europa League progress, seemed to cause as much indecision in Liverpool’s ranks as it did consternation in the stands. The ripple of applause he received for holding off or, depending on your persuasion, pushing over Pablo Zabaleta in the box just before half-time seemed more in relief than appreciation. Attacks continued, with Aguero heading over 20 seconds into the second half and Sterling bundling wide a Lallana cross, but the quality level dropped somewhat. In an instant it was raised again, in the 75th minute, when Coutinho cut in from the left, dropped his shoulder and unleashed an arcing shot which dipped over the outstretched fingertips of Hart. Once again going behind sparked City to go to another gear and, having sent on striker Wilfried Bony for Fernandinho, Aguero’s angled shot whistled just past the far post after Lovren had lunged in. A frenzied final 10 minutes saw Coutinho have another shot deflected over, Bony escape with a yellow card after appearing to lead with an elbow on Lallana, substitute Daniel Sturridge roll a shot wide with only Hart to beat and Silva flash a shot just off target with the seconds ticking down. Sergio Aguero and Manchester City rediscovered their touch as the champions turned on the style in the second half to win 4-1 at Stoke. Aguero struck twice as City won for the first time in five Barclays Premier League games to keep some pressure on Chelsea at the top of the table. Aguero’s first strike in six games since returning from injury was cancelled out by Peter Crouch before the break but he grabbed a second from the penalty spot after James Milner had put City back ahead. Samir Nasri claimed the fourth with a fine strike 14 minutes from time. The first half was a compelling affair but both sides might have had more than a goal apiece after efforts were ruled out at each end. Crouch was first denied by an offside flag and Aguero had what would then have been his second chalked off in confusing circumstances on the stroke of half-time. Handball was the offence, although it was only the faintest of touches and possibly not deliberate. But City reacted well to the controversy and finally showed some champion quality after a disappointing few weeks by running in three second-half goals. 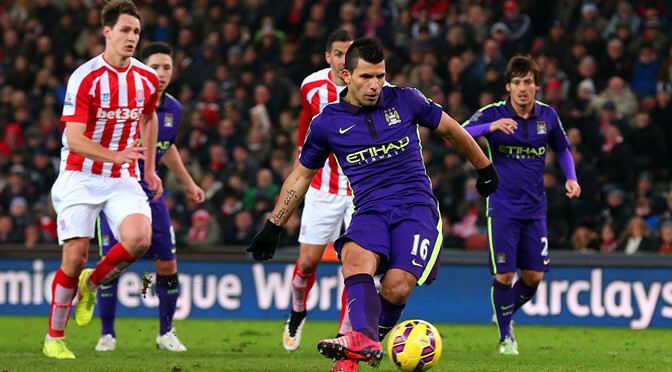 City ended as the dominant force but Stoke had a large say in the early proceedings. City did have an early chance but Aguero scuffed a shot when he might have been better leaving it to Fernandinho. After that Stoke looked the more confident for a prolonged spell with the lively Victor Moses troubling Joe Hart with a well-struck shot. Crouch, back in the Potters’ starting line-up after a late leveller at Newcastle on Sunday, got his head to the resulting corner but Milner cleared off the line. There were appeals for handball against Milner but referee Lee Mason gave nothing. 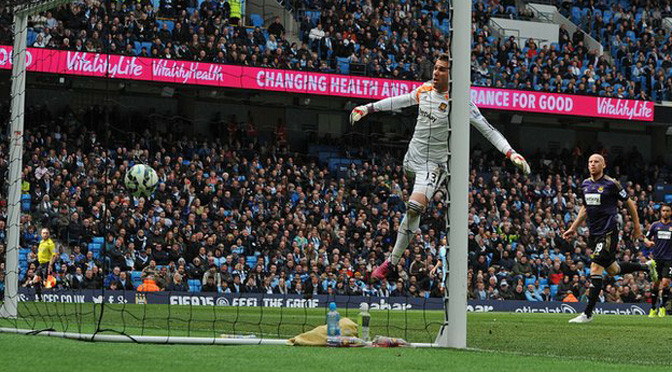 Crouch thought he had scored when he pounced on a rebound after Hart parried a Moses effort but the flag was raised. City survived another scare as Hart beat away a strong effort from Steven Nzonzi and Moses smashed the rebound inches wide. They were chances Stoke looked likely to rue missing as City seized the lead following a moment of Aguero brilliance in the 33rd minute. The Argentinian seized on a long clearance and ran at Marc Muniesa and finished with a superb low shot across goal. But City had not yet weathered the storm and Stoke replied immediately. Marko Arnautovic curled in a wicked cross from the right and Crouch ducked as he slid in to expertly guide home a firm header. 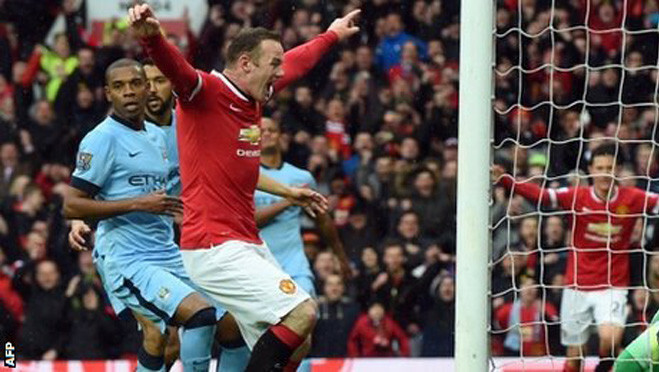 City thought they had reclaimed the lead just before the interval but controversy erupted as Mason denied Aguero. Stoke were caught flat-footed as Fernandinho picked out Silva with a lofted ball and the Spaniard turned the ball across goal for Aguero. Aguero appeared to have an easy tap-in but the ball deflected off a defender and he had to readjust to use his head. After doing so the ball brushed his hand on the way in. Mason initially seemed to give the goal but Stoke’s players protested and it eventually became apparent the referee agreed something untoward had occurred. It may have been that Aguero had cunningly used his hand but replays suggested that would be a harsh interpretation. If City felt wronged, they soon put it right. 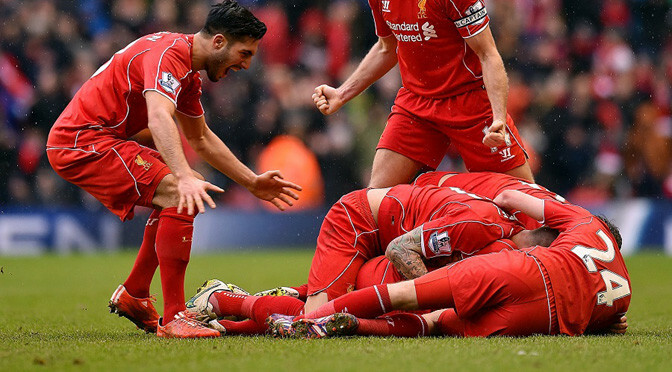 Milner made no mistake with his head as he rose to meet a Nasri cross 10 minutes into the second half. Milner, whose future beyond the end of the season remains uncertain as contract talks continue, celebrated by mimicking the action of a DJ in front City fans. Whatever that meant, City appeared to be getting back into their groove. 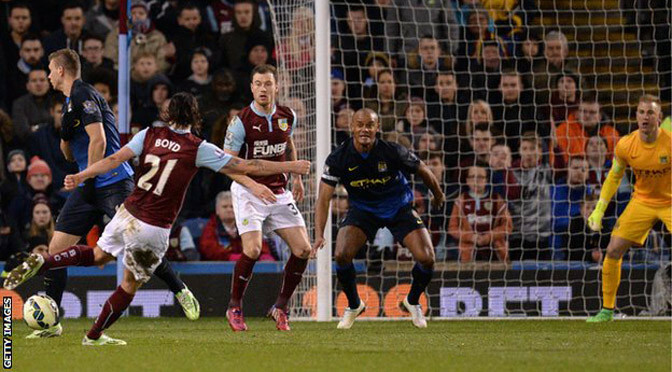 They went further ahead after 70 minutes as Silva proved too tricky for Geoff Cameron and was pulled down. Aguero clinically dispatched the spot-kick. Nasri made victory certain six minutes later as he drove at the Stoke defence, checked inside on the edge of the area and fired a shot across goal and in at the far post. Stoke were beaten although Mame Biram Diouf did threaten on the break and might have had a free-kick after tangling with Eliaquim Mangala – who could have been sent off – but Mason ruled contact accidental.